ACE is a very successful small satellite mission that is measuring the concentrations of more than 40 atmospheric constituents by absorption spectroscopy using the Sun as a light source. The initial principal goal of the ACE mission was to make ozone-related measurements in the stratosphere, but is now making observations that range from organic molecules associated with pollution in the troposphere to carbon dioxide trends in the lower thermosphere. The ACE instruments are an infrared Fourier transform spectrometer (FTS), a UV/visible/near IR spectrograph (MAESTRO) and a two-channel solar imager, all working in solar occultation mode. The high-resolution (0.02 cm–1) FTS is the primary instrument on the satellite, and it covers the mid-infrared spectral region (750–4400 cm–1). After 10 years in orbit, this book overviews and celebrates the ACE mission. 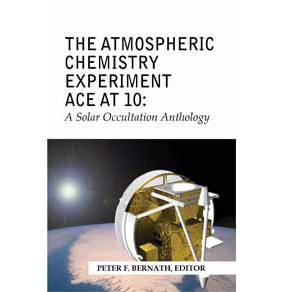 The book is based in part on the presentations made at the joint ACE-SAGE-III-ISS science team meeting held at Old Dominion University on October 15–17, 2012. In addition to ACE-related chapters, contributions associated with other limb-sounding instruments including ALTIUS, SMILES, SOFIE,HALOE, and SAGE II are also included. ISBN 978-0-937194-54-9, 2013, Softcover, 352 pages, US$120.00.